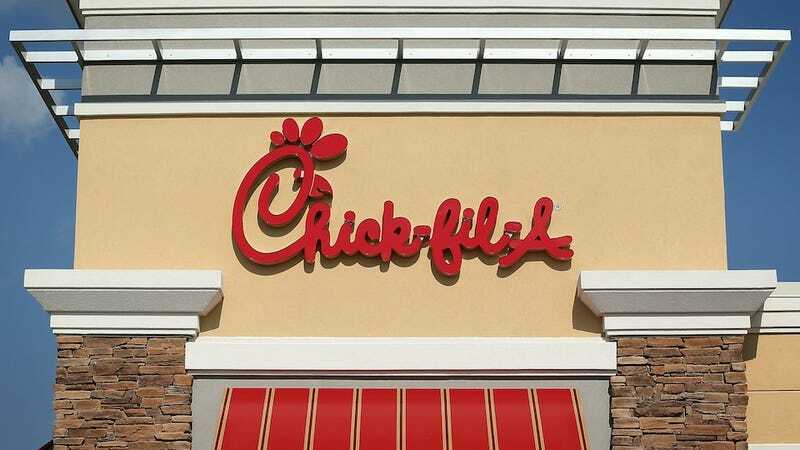 Bigots in New Hampshire are going to have to find a way to support limited rights fer the queerz — the manager of the state's only Chick-fil-A has announced that unlike his parent company's CEO, he's just fine with gay people. So fine, in fact, that he'll continue to be a sponsor the state's gay pride festival so all the gays can gay around proudly, in the open, in ways that make all the people participating in Chick-fil-A Appreciation Day terribly uncomfortable. In both my personal and professional life, I have had and continue to have positive relationships with family, friends, customers and employees in the LGBT community. It would make me sad if someone felt that they were not openly welcomed into my life or restaurant based on their belief, race, creed, sexual orientation or gender. Chick-fil-A at Pheasant Lane Mall has gay employees and serves gay customers with honor, dignity and respect. We also don't discriminate in giving back to the Nashua community, donating to a wide variety of causes. I would challenge people to come have a conversation with me before they make assumptions or boycott my restaurant. Come to my restaurant and see for yourself that my team and I only have one mission: To serve exceptional experiences to all. To be fair, CEO Dan Cathy never said that he was morally opposed to gay people's money, just that he was against gay people's rights. Totally different things.